The device so configured looks like a s/c transmission line stub and we would expect that the input impedance would be a very small resistance and small inductive reactance. Above is a calculation of the stub, input impedance is calculated as 0.27+j8.60Ω. 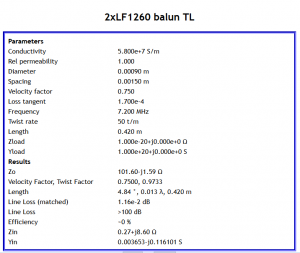 At a current of 1.41A, the differential voltage at the input end of the transmission line is 12.1V. With a measured input current of 1.41A, we would expect dissipation of 1.41^2*0.27=0.54W. Most of this loss is conductor loss, increasing the Dielectric loss tangent by a factor of 100 made an insignificant difference to the result. Above is a thermograph of the device after 15min at 1.41A. Temperature has risen from 8.0° to 12.6°, a rise of 4.6°. Previous measurements of this device suggested temperature rise of 10.4°/W, indicating 4.6/10.4=0.44W, fairly consistent with the estimated 0.54W based on the transmission line model. 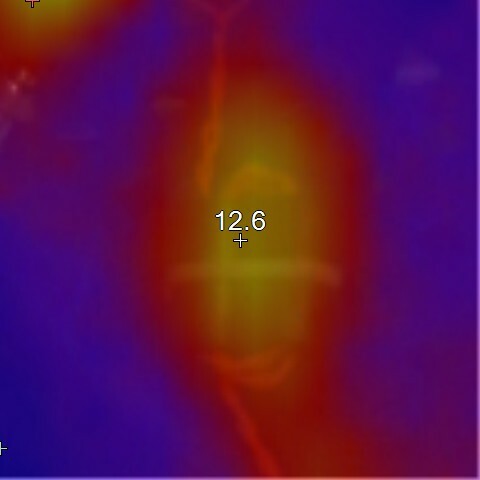 Any loss due to differential magnetic or electric field fringing into the ferrite is so small as to not contribute significantly to the measured temperature rise. 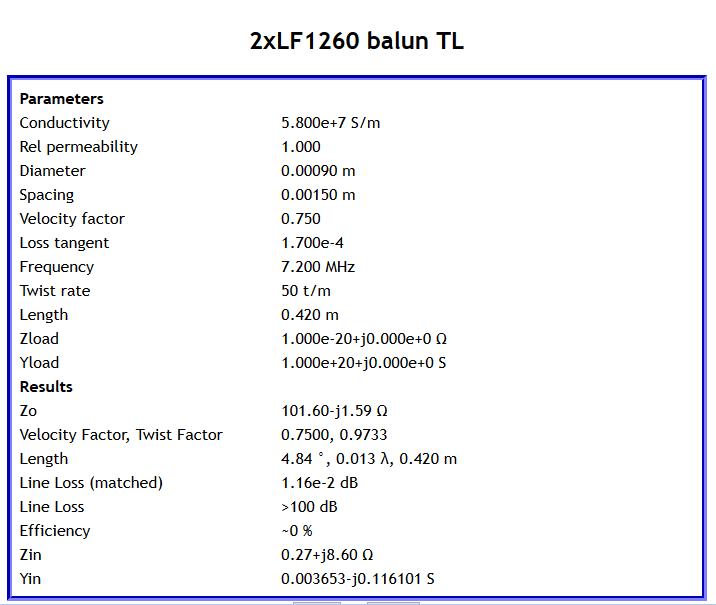 Dissipation from the balun under conditions of high differential current and negligible common mode current yielded temperature rise that is consistent with the loss expected from the transmission line conductors alone. ———. Jan 2015. Low power Guanella 1:1 tuner balun using a pair of Jaycar LF1260 suppression sleeves. ———. Sep 2015. 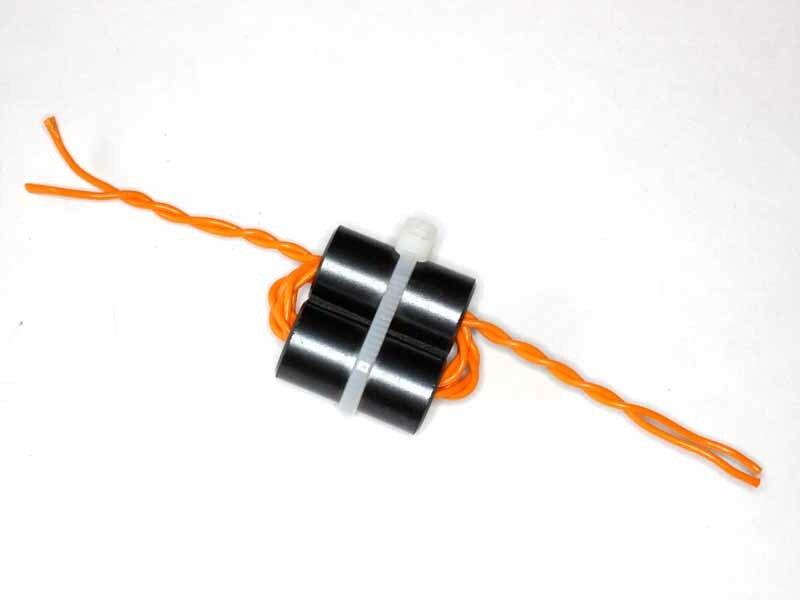 Differential flux leakage in a Guanella 1:1 balun.